Ever since the last sugar cane processing plant closed in 2000, Puerto Rico's agricultural industry has struggled mightily. Legalized hemp may change that. Puerto Rico might have one of the most underdeveloped agricultural sectors on the planet. According to statistics provided by the US Department of Agriculture, Puerto Rico farming income has decreased by two-thirds since 1964, a result traceable to the implosion of the sugar cane industry that once formed the backbone of the island’s economy. Sugar cane is no longer grown for export in Puerto Rico (the last processing mill shut down in 2000), and unfortunately nothing else has come along to take its place. Plantations that once produced tons of sugar cane now sit abandoned, surrounded by endless acres of unused fertile land. Puerto Rico currently imports about 85 percent of its food, a testament to how stagnant the agricultural economy has become. Policymakers and farmers have been trying for years to start an agricultural renaissance, but until now none of their plans have gained traction. 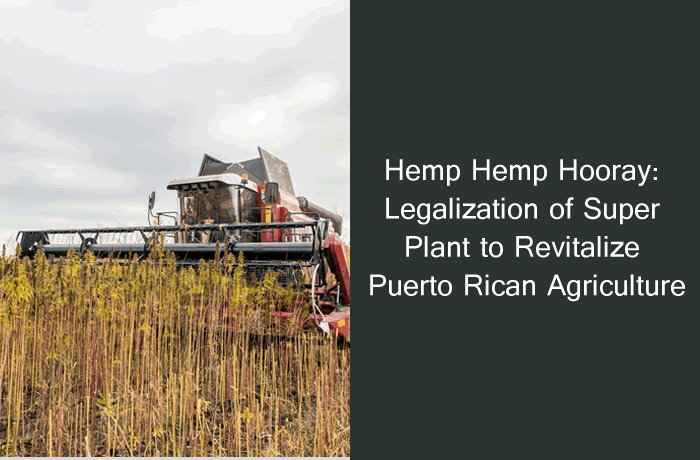 But those dreams of renewal may finally be satisfied, thanks to the passage of a Puerto Rican Congressional bill that will introduce industrial hemp production to the island, as well as to changes in federal law that will unshackle the sleeping giant that is the US hemp industry. 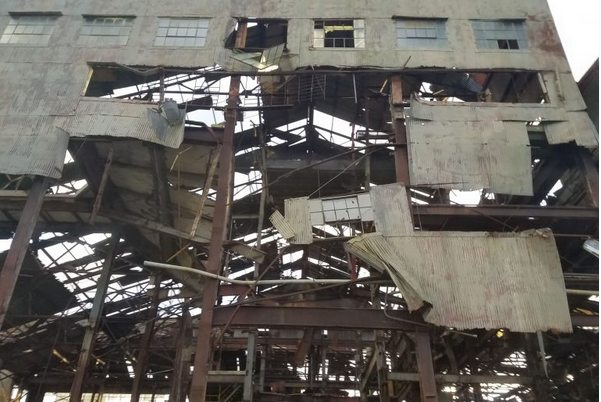 An old, damaged sugar cane processing plant in Puerto Rico. When the Puerto Rican government was forced to default on its $72 billion debt in August 2015, there was an immediate sense of urgency to find solutions to the island’s severe economic plight. International bankers showed no mercy and the US government forced austerity on the island through its Financial Oversight and Management Board, so Puerto Rico had no choice but to try to grow itself out of debt, as difficult as that may be to accomplish. In such dire circumstances, the promise of industrial hemp was impossible to ignore, which is why the House of Representatives of Puerto Rico passed a bill legalizing hemp on December 10, 2017, with the Senate following suit on October 9, 2018. This was obviously an important milestone for the hemp industry in Puerto Rico, and the timing of the Puerto Rican Congress to act when it did was fortuitous, as President Donald Trump signed the latest omnibus Farm Bill on December 20, 2018. One of the statutes included was the Hemp Farming Act of 2018, which reclassified industrial hemp as an agricultural product that can be grown, processed and traded on US soil without any legal restrictions. Hemp, of course, had been listed as a Schedule I controlled substance despite containing only trace amounts of THC, making it illegal to sell commercially outside the borders of states with pro-hemp laws on the books. There is no doubt that the legalization of industrial hemp in the United States will send profits soaring for those involved in the farming, processing and distribution of hemp. The trade in just one hemp derivative, CBD oil, is projected to surpass the $22 billion mark globally by the year 2020, according to cannabis analyst the Brightfield Group, after sales accounting for $202 million in 2017. CBD oil is known to have a number of healing and health-preserving applications, and in most cases, CBD products are available for sale without a prescription. Industrial hemp is currently used in more than 25,000 products, many of which are destined for growth as more retailers begin to stock hemp-based items. From its use as a fuel source, to make plastic for car parts or as fabric for clothing, hemp is set to revolutionize the marketplace, and Puerto Rico is getting on board just as the hemp industry is set to launch. It’s not just a matter of joining the gold rush before the gold is gone. Puerto Rico is ideally situated to take advantage of the expanding demand for hemp, as the island’s tropical climate will support a perpetual grow season and the production of multiple crops during each 12-month period. With its agricultural sector currently in hibernation, the island can offer an abundance of available land for those seeking entry into the hemp industry. Its Caribbean location will allow for fast and convenient shipping of raw or processed hemp — or finished hemp goods — to customers in North, South and Central America. And due to its proximity to and close relationship with the United States, it should have no trouble attracting well-heeled investors from the mainland, but special care will have to be taken to assure Puerto Rican farmers and entrepreneurs are not pushed to the sidelines (as happened with sugar cane). The passage of the Hemp Farming Act means that many of the barriers that restricted the growth of the hemp industry in the United States will be eliminated, giving every state in the union (plus Puerto Rico) the opportunity to fully develop their hemp farming and processing operations. Complete access to all banking services, including checking and savings accounts and loans to finance new initiatives. Full credit lines from credit card companies. The ability to purchase comprehensive crop insurance, which is critically important in areas subject to heavy storm damage, such as Puerto Rico. The right to transport and sell raw hemp or finished hemp goods across state lines and national borders. The unrestricted right to form business partnerships with hemp industry participants in other locations. Federal laws against hemp created confusion and uncertainty for states that had legalized it, which disrupted business operations and likely scared away investors who might otherwise have supported hemp initiatives. Now, investors can jump in with confidence, and Puerto Rico should have an easier time recruiting them than other locations in the United States, given the island’s climatological blessings and abundance of unoccupied farmland. The virtually unlimited range of products that can be made from hemp gives the industry growth potential, and localities that produce it should have little problem finding niches in the marketplace to fill. Because hemp is so versatile and can be used to create so many things, manufacturers of hemp products will be able to help Puerto Rico reduce its reliance on imports, which will inevitably make island living more expensive while stifling local economies. The production of CBD oil for medical applications will likely be emphasized, since CBD dovetails so nicely with the island’s blooming medical marijuana industry. Another possible focus could be on the production of a rock-solid construction material called hempcrete, which can function as a lightweight and relatively inexpensive replacement for concrete, bricks, timber and conventional insulation. Hempcrete will be needed as the island continues to rebuild following the devastation wrought by Hurricane Maria. One of the most attractive aspects of hemp is its positive ecological profile. Hemp has a natural resistance to pests, so the worry of pesticides in its production is greatly reduced. It requires only modest amounts of water to grow healthy and strong, which will make it a viable crop in any region of Puerto Rico. Hemp plants soak up prodigious amounts of carbon dioxide from the atmosphere, thereby helping to combat global warming. The plants can remove heavy metals and other contaminants from the soil in a process known as phytoremediation, which helps restore damaged soil and keep it clean and productive for indefinite periods of time. Because hemp plants are so tall and have such deep roots, weeds have a difficult time gaining a foothold in hemp fields, quashing the need for herbicides or hand weeding. Industrial hemp is a natural choice for those who want to grow organically. Two of the major investors that have announced their intentions to become involved in the Puerto Rican hemp industry — StereoVision and Hemp, Inc., both headquartered in Nevada — plan to sponsor organic farming initiatives in full partnership with aspiring Puerto Rican hemp farmers. Organic hemp makes the most sense for Puerto Rico, as there would be no escape for the three million-plus people who live on this 3,500-square-mile island if its environment is contaminated by agricultural chemicals. Farming clearly has a role to play in Puerto Rico’s ongoing plans for redevelopment, but only if it follows the edicts of ecologically sustainable practice. The outlook for industrial hemp in Puerto Rico is bright, but the industry is not quite ready to hit the ground running. When the Senate passed HB 1071 in October, it did so only after adding more than 100 amendments to the bill, which means it cannot be signed by the governor until the House and Senate negotiate a final version that is acceptable to everyone. Most of these amendments were added at the insistence of political conservatives motivated by anti-cannabis paranoia. Apparently, they believe that hemp legalization is some sort of Trojan horse that will be used to flood the streets with recreational pot, and they are demanding regulations that critics fear could price many prospective producers right out of business. Among their draconian provisions, the amendments would require participants in the hemp industry to take extraordinary security measures, such as installing electronic surveillance systems, hiring security guards and fencing in fields where hemp crops are being grown. In addition, seed producers and distributors would be hit with strict licensing procedures and would be required to keep detailed records of all their activities. Meanwhile, those who handle hemp-related financial transactions would have to implement strong measures to prevent money laundering. Amendments like these could raise production costs substantially if they are allowed to go into effect, and some suspect that is actually their purpose. In addition to these restrictions, a regulatory board that includes representatives from the legislature (including, presumably, opponents of hemp) would be formed to oversee operations in the industry. It has been suggested that they might use their influence to classify products that contain CBD as forms of medicinal cannabis, meaning their availability could be severely restricted. Hemp is indeed far different than cannabis, and the industrial hemp industry may struggle to get off the ground in Puerto Rico if the final version of HB 1071 includes needless qualifications and burdensome regulations. Ultimately, hemp will likely be a success on the island even if producers are forced to jump through a bunch of hoops, simply because the plant is so useful and the need and desire for it so acute. But, for the sake of Puerto Rico’s citizens and its slumbering agricultural sector, it must be hoped that common sense will prevail and that hemp producers will be given free rein to unleash their industry’s enormous potential, which could reinvigorate a repressed farm economy that is capable of greatness. This article was originally published by Big Buds Magazine and is reposted with permission.